A recognised Taijiwuxigong teacher and Taiji 37 teacher from the Buqi Institute and by the late Dr. Shen Hongxun (founder of buqi and taijiwuxigong), Poh-Eng runs regular classes and retreats. 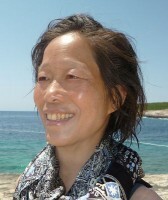 Poh-Eng has refined her energy healing skills with over 17 years of experience. She works to facilitate a healthy movement of chi throughout the body, She works with the client to open up blocked pathways which can be caused by problems on the physical , energetic, emotional , mental or spirit level. The client often feels lighter, happier, more comfortable in their bodies and grounded. Fundamental to Buqi is the double viscous circle of poor body posture connected with negative emotional or mental issues that over time set in motion a downward spiral of poor health. Contraction and misalignment of the body is addressed and the client is taught corrective exercises to effect long term change. Buqi with Poh-Eng has supported a wide range of symptoms.These Include, for example asthma in children and adults, repetitive strain injuries, anxiety attacks, headaches and migraines, childhood and adult traumas, depression and addiction, palliative support for cancer patients. Buqi has supported women throughout their pregnancy and in labour, Buqi has released attatchments / spirit problems, also postural correction and muscular tension in professional musicians, or offers practical advice in stress management etc. Unique to the Buqi healing system is the use of tai chi vibration forces and health information transmission to activate vital energy flow and draw out negative factors stuck in the body (such as stagnant energy, old emotion, metabolic waste etc.) If the body’s vital energy is blocked it can cause a variety of symptoms including pain in any area of the back/organs, stiffness, anxiety, depression and general poor health. Buqi works to alleviate these symptoms. Plant Spirit Medicine was founded by Eliot Cowan, a trained Shaman of the Huichol Native American Indians. Plant Spirit Medicine is a deep healing modality based on two ancient healing traditions: Classical Chinese Medicine and Shamanism. It focuses on the underlying elemental balance of each individual. If this balance improves, the symptoms of specific conditions will also improve. Symptoms are the messengers of imbalance at a deeper level and merely treating the symptoms will not resolve the underlying causes of dis-ease. The plant spirits touch the places in the client where their spirit is needing support, bringing them back to a state of harmony and balance. It is usual to feel deeply relaxed and calm after a session.